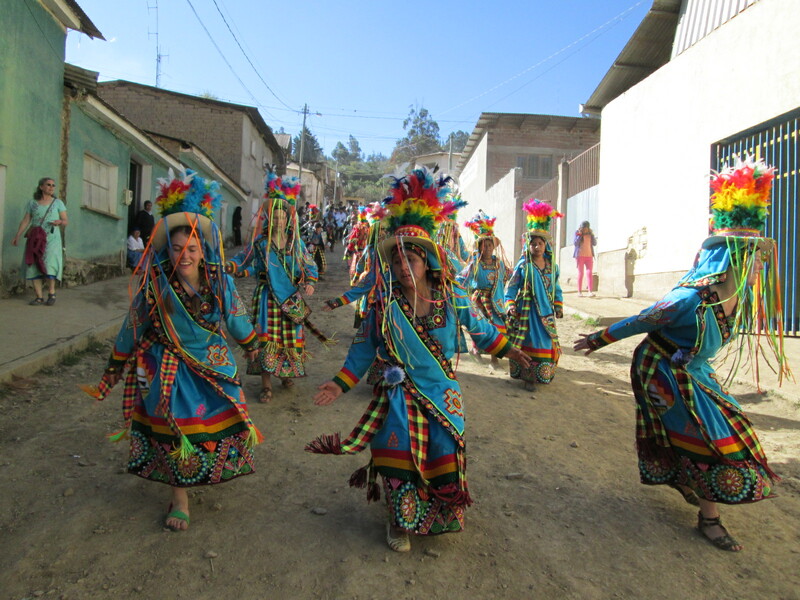 July’s highlights were the technical assistance provided by visiting mother and daughter Debora and Selina Petschek and the Fiesta del Virgen de Carmen. 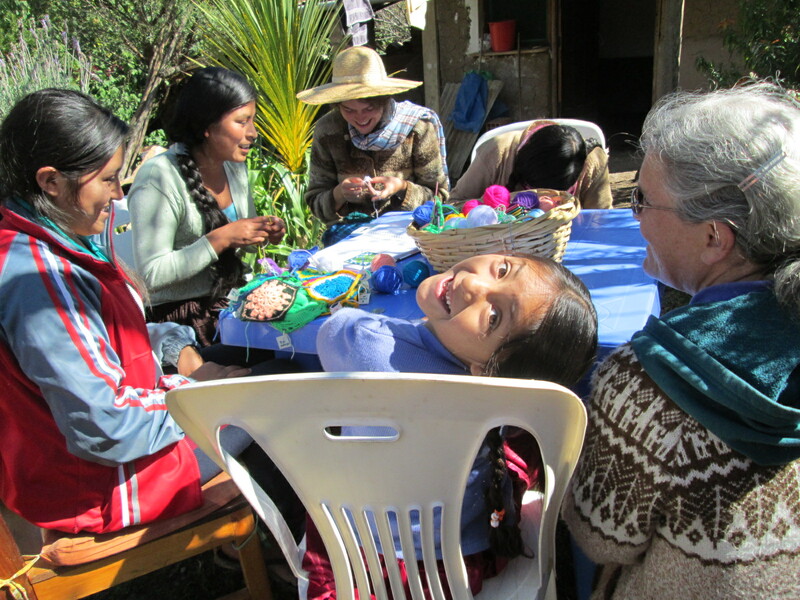 Selina spent 6 weeks working with the Club de Artesanas members and Huancarani weavers in early 2013. The women and chicas knocked on our door at all hours wishing for assistance with knitting patterns. This year Debora brought a copy of “The Granny Square Book” by Margaret Hubert and she and Selina were kept busy helping the women and teenagers interpret the instruction to make samples. There are 75 granny square patterns in the book and well over half were crocheted. 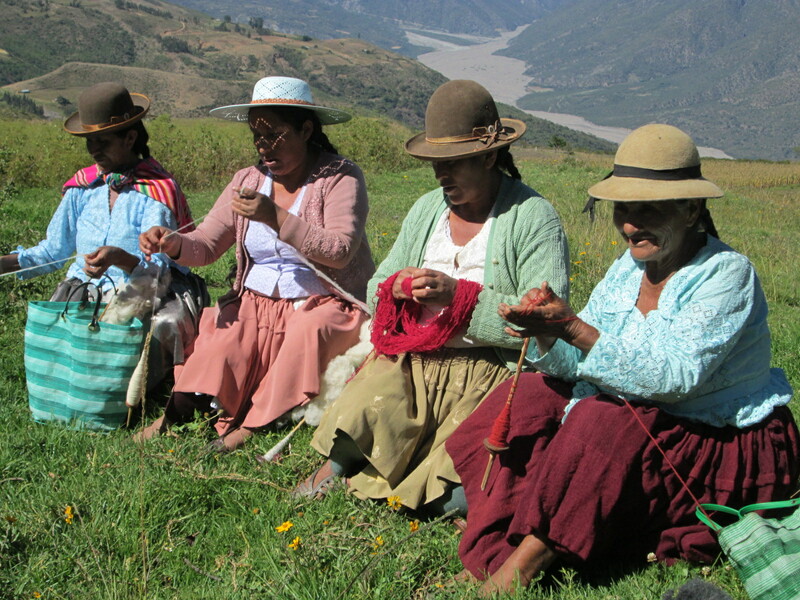 There are few local resources available for knitting and crochet projects. The local yarn “shops” stock acrylic yarn made in China, albeit in a rainbow of colors. 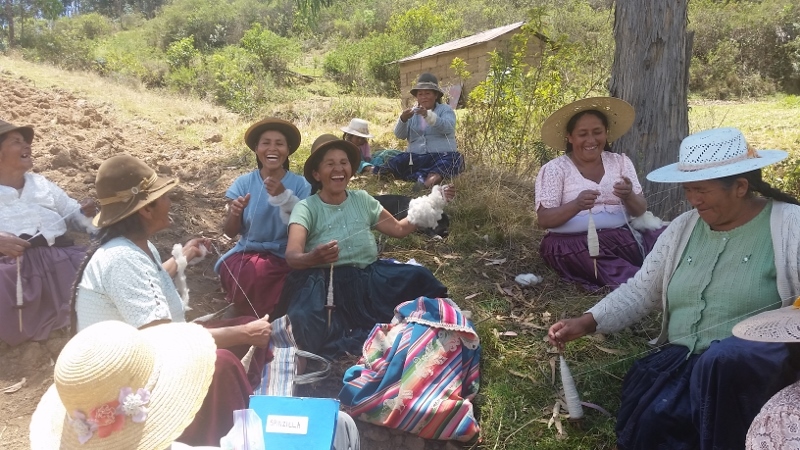 Only 1 tiny size crochet hook and knitting needles may be purchased in Independencia. A huge thank you to Debora for lugging supplies all over South America to donate to the Club. We now have double pointed wooden knitting needles in a variety of sizes, skeins of bulky wool yarn, and Margaret Hubert’s great granny square pattern book. The knitting needles and skeins will be saved for the day when another visitor needs the supplies to help the women work out patterns in our knitting pattern books. 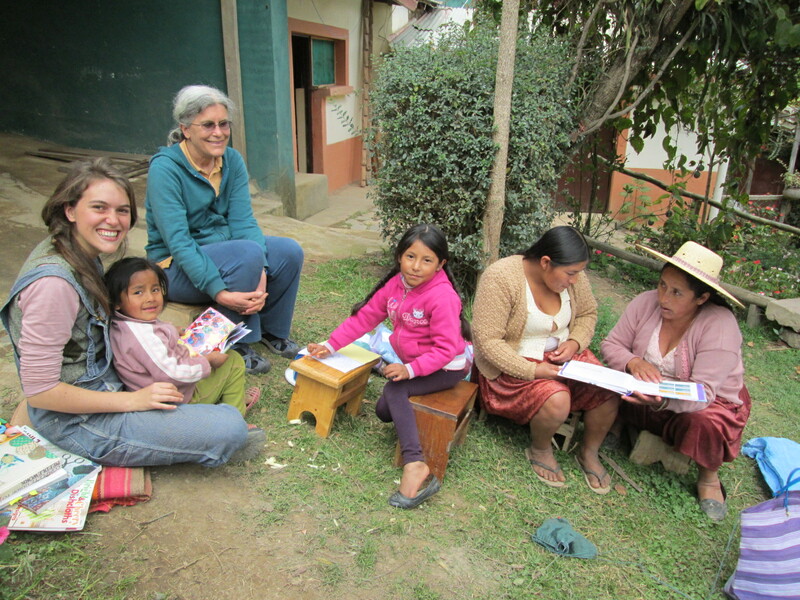 Debora had the local carpenter make some wooden spools to teach knitting to the 4-6 year olds. and was game to learn the 8 energetic steps that our dance group would be performing. 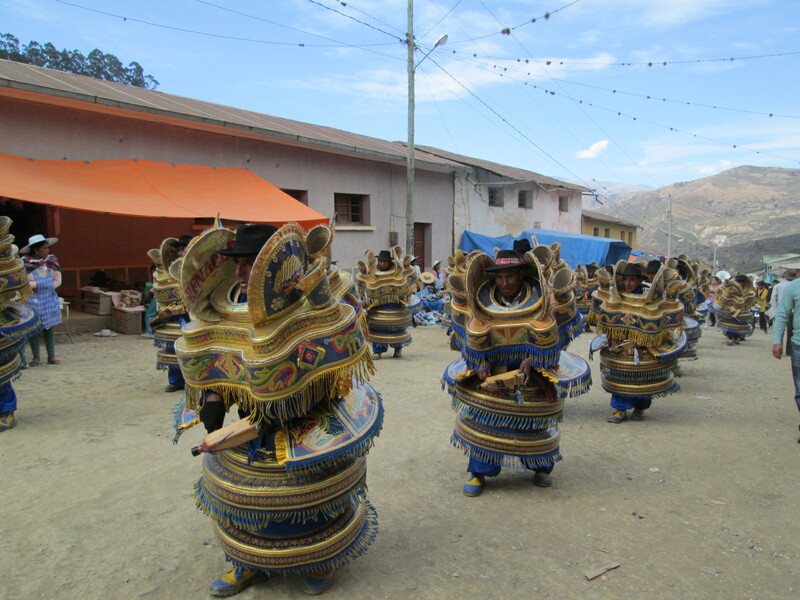 The dance group consisted of 3 German volunteers, 3 North Americans (although Debora is Argentine by birth), and 7 teenagers from the Don Bosco high school. We christened our group the “Chajruys” (Quechua for mixture). Carmen, a local high school junior and our fearless leader, worked us hard and I vowed to be in better shape to dance next year. to pay our first devotion to the Virgen de Carmen. Debora, Selina, and I all danced because the attire was street clothes. Debora and I shared a costume for the next 2 days of Fiesta dancing and I was secretly relieved not to dance both days. The Fiesta fell in the middle of the week and was poorly attended. The municipal government had done a survey locally with the thought of moving the Fiesta to the weekend, but 75% of the responses stated that the Fiesta had to take place on July 16th. There has been so much migration to the cities that many who would like to return to Independencia for the Fiesta don’t have the flexibility of the farmers to take off work. Last year there were 7 dance fraternities with 4 different folkloric dances represented. 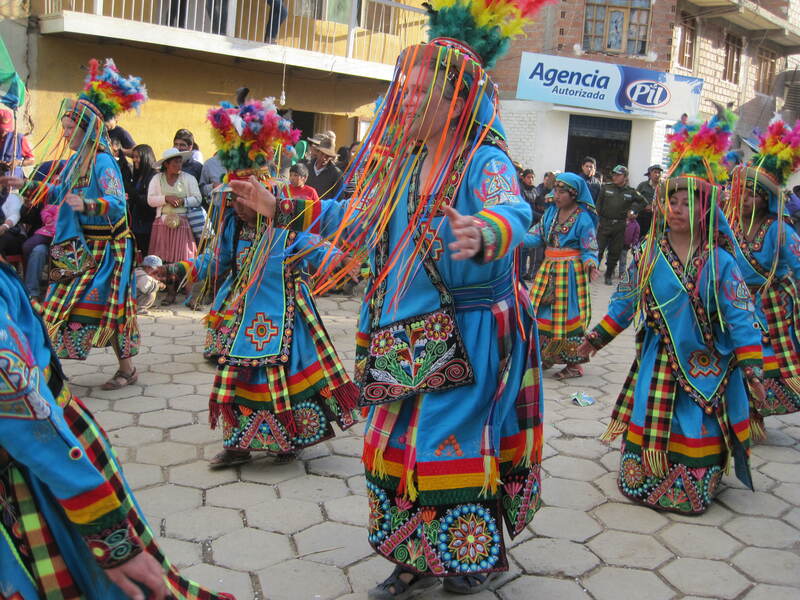 This year there were only 4 dance fraternities and just the Tinku and Morenada were danced. The local parish who usually sponsors the Diablada dance group decided to use the funds to paint the church. The other school in town also opted out this year for lack of funding. We all hope this year was just a fluke and not a downward spiral ending with the disappearance of the Fiesta.